10/13/2014Share this story on Facebook! 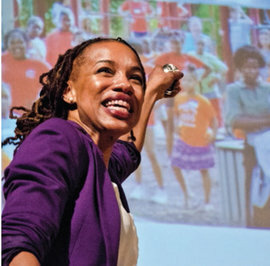 From Internet radio to green burials, Ithaca College’s first ever TEDx conference had it all. There was laughter, there were tears, there were gaffes, singing, and even a bit of theatrical improvisation packed into the emotionally unpredictable, full-day event. More recently, independent TEDx conferences have sprung up across the country. The college’s event, organized by students Michela Moe ’14, LuLu Helliwell ’16, and Ilana Miller ’14, brought together 16 speakers including students, alumni, faculty, and community members. Monique Markoff, a professor in the Department of Education, began the day with a speech about Blended Learning—the concept of combining technology with education to create a more holistic experience. The event continued with speeches on topics ranging from disability to eco-friendly burials, to gravitational waves. The day was divided into blocks. Each block began with a TED talk video, selected by the hosts. Three speakers followed each video, taking 15 minutes apiece. Highlights from the event included a talk by the program manager for Rescue Mission Ithaca, Michael Koplinka-Loehr, about ending homelessness in Tompkins County, and one by Rachel Gray ’15 and Associate Professor of Religion Rachel Wagner about video games and the apocalypse. Junior Aileen Tartanian ’15 spoke at length about mental illness and the stigmas attached. The TEDxIthaca College event was just the beginning of many conversations. View more of the Ithaca College TEDx presentations.